Having laminate flooring, ceiling light point and part glazed wooden door to Entrance Hall. 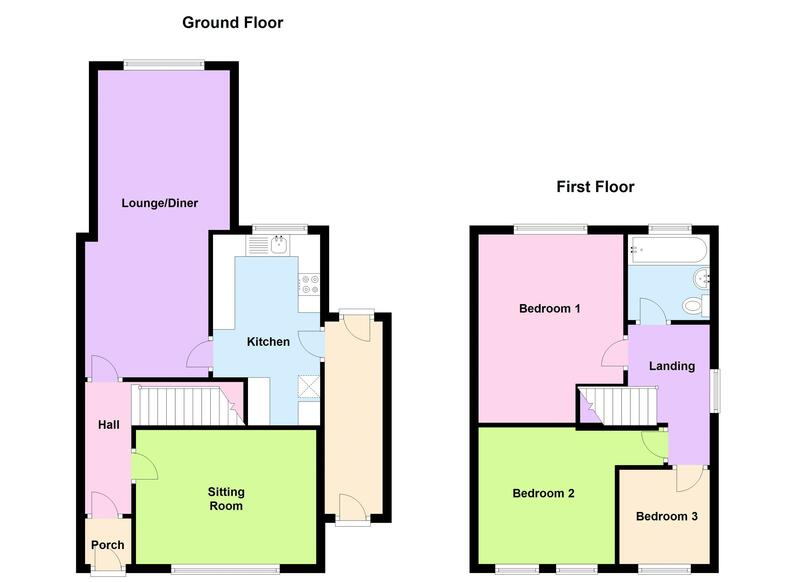 Having laminate flooring, single panel radiator, stairs to first floor landing, and doors to sitting room and lounge/diner. Front Facing - Having feature fire surround, single panel radiator and ceiling light point. Rear Facing - Having laminate flooring, double panel radiator, inset gas fire, two velux windows, two ceiling light points and door to kitchen. Rear Facing - Fitted with a range of wall and base units with work surfaces over, courtesy tiling, inset sink unit, built in electric oven with gas hob over and cooker hood above, plumbing for washing, space for fridge freezer, two ceiling light points and door to side veranda. Having doors to front and rear and ceiling light point. Side Facing - Having access to loft space doors to bedrooms and bathroom and ceiling light point. Front Facing - Having fitted wardrobes, single panel radiator and ceiling light point. Rear Facing - Fitted with suite comprising paneled bath with mixer shower over, low flush wc, pedestal wash hand basin, vinyl flooring, single panel radiator, extractor and ceiling light point. Having creteprint style driveway with parking for more than one car. Having enclosed rear garden with southerly aspect and lawn and store/former garage opening onto rear service road currently not accessible.